Easy to use and ideal for smaller urban gardens or larger gardens with small lawn areas. SUpplied as a 1.25L bottle of concentrate, needs diluting. Child, pet and bee safe, ecofective Natural Lawn Feed promotes healthy, luscious grass and helps reduce disease and moss. Derived from natural ingredients including molasses sugar, the concentrated liquid feed is quick and easy to apply and is simply diluted in a watering can or sprayer, creating less mess and waste. The ingredients result in a quicker uptake of nutrients, creating a lush, green lawn in no time for you and your friends and family to enjoy. 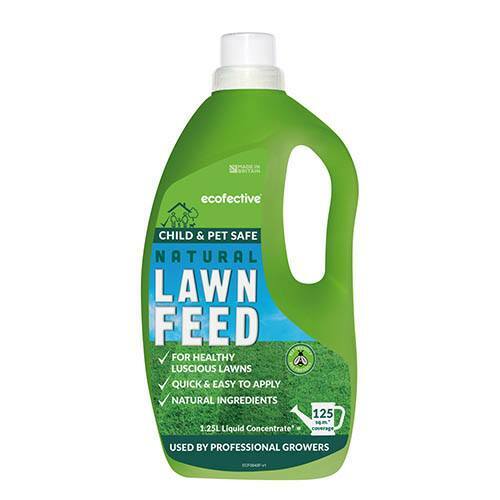 Child, pet and bee safe, ecofective Natural Lawn Feed is used extensively by professionals and gives 125sq.m of coverage from just 1.25 Litres. Supplied as 1 x 1.25L bottle to give 125sq.m of coverage. Suitable for small to medium sized lawns. It’s important to prep your lawn before using lawn feeds. Treat weeds and moss in your lawn and if mowing before application, do this 4 days before applying ecofective Natural Lawn Feed. Using the integral measuring cap add 2 inner capfuls into 6 Litres of water. Using a fine rose or sprinkle bar, apply the feed over 8sq.m ensuring even coverage by using a sweeping motion. It’s best to use the feed in the early morning or evening and not use in direct sunlight to reduce the risk of scorching the grass.